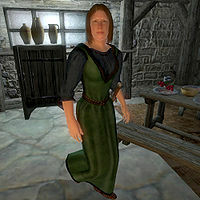 Ulrika Ulfgar is a Nord healer residing in Bleaker's Way, a peaceful village in the Great Forest, where two families, the Ulfgars and the Dalvilus, live together in harmony. She resides in the Ulfgar Family's House across the street from Hrol Ulfgar's house. She wakes up every morning at 6am and always starts the day with a two-hour breakfast. At 8am, if you have reached stage 30 of the related quest, she will leave the house and meet up with Hrol inside the Bleaker's Way Goodwill Inn for two hours. She will then return to the house and stroll around inside until 2pm when she returns to the inn. She will spend four hours socializing with the other regulars until 6pm when she will find a seat in the taproom and enjoy a two-hour dinner. She returns to the house at 8pm and just wanders around until her bedtime at midnight. The exception to this routine occurs during the final stages of the related quest, when she finds out that the Dalvilu clan was behind the murder of Hrol Ulfgar. She will then join the mass combat against her former friends and fight to the bitter end. She wields an iron dagger and wears a set of middle-class attire consisting of blue & green outfit with a pair of quilted shoes. She carries around a spare pair of tan linens, her key and a small amount of gold. Ulrika knows a set of standard healer spells.